SV8CS : NEW digital Mode (JT9-2) by K1JT. 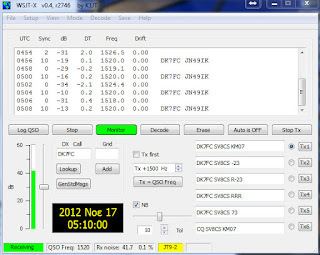 Joe K1JT has made a new digital mode for Low bands (MF 470/500 Khz and LF 136 Khz). Yesterday I was on 136 Khz (dial usb) monitoring the band on LF and copy very well Stefan DK7FC transmiting in JT9-2 digital mode with this new program WSJT-X by K1JT. Using Kenwood TS-480 for RX with a QUAD-Loop horizontal antenna with total lenght 230m.